ways of men, the God-Man would not intrude Himself into public life; He would await, for the inauguration of His Divine ministry, some man who, having preceded Him in a similar career, would be hereby sufficiently accredited to introduce Him to the people. The chants of holy Church in honour of the Precursor’s nativity have begun; and already everything about the Feast is telling us that it is one of the solemnities dearest to the heart of the bride. But what would it be if, going back to former days, we were able to take our share in the olden manifestations of Catholic instinct on this day! In those grand ages wherein popular piety followed with docile step the inspiration of the Church, such demonstrations suggested by a common faith, on the recurrence of each loved anniversary, kept alive in every breast the understanding of the Divine work and its mystic harmonies thus gorgeously displayed in the cycle. Nowadays, when the liturgical spirit has fallen to a lower standard in the minds of the multitude, the Catholic verve, which used to urge on the mass of the people, is no longer felt in the same marked way. Left to itself, and hence without unity of view, popular devotion often lacks proportion; nevertheless, these regrettable inconsistencies cannot impair the spirit of piety ever inherent in holy Church; she is ever guided aright by the spirit of prayer that is within her; she ever holds the sure hand of her unerring authority on all pious demonstrations of a non-liturgical character, as well as on the diminutions of the former solemnity of her own sacred rites: hence she is ever on the watch to prevent her maternal condescension becoming a pretext for opening the way to error. We are far, however, from the days when two rival armies, meeting face to face on St John’s eve, would put off the battle till the day after the feast. [The Battle of Fontenay (Saturday, June 25, 841): Nithardi history. I, ii] In England, though no longer kept as a day of obligation, the feast of St. John is still marked in the calendar as a double of the first class with an octave; and gives place to no other, except the festival of Corpus Christi; it is, moreover, a day of devotion, and continues to attract the attention of the faithful as one of the more important feasts of the year. Another festival is yet to come, at the end of August, calling for our renewed homage to the son of Zachary and Elizabeth, namely the feast of his glorious Martyrdom. But, venerable as it is, according to the Church’s expression, [Collect of the day] its splendour is not to be compared with that of this present festival. The reason is, because this day relates less to John himself, than to Jesus Whom he is announcing; whereas the feast of the Decollation, though more personal to our Saint, has not in the Divine plan the same importance which his birth had, inasmuch as it preludes that of the Son of God. There hath not risen among them that are born of women a greater than John the Baptist, are the words to be spoken by the Man-God of His Precursor; [St. Matt. xi 11] and already has Gabriel, when announcing both of them, declared the same thing to each, that he shall be great. [St. Luke i 15, 32] But the greatness of Jesus is that He shall be called the Son of the Most High, and the greatness of John is that he shall go before Him. [Ibid.] The name of John, brought down from Heaven like that of his Master, proclaims the grace which Jesus, by saving mankind, is to bring to the world.[Ibid. i 13, 31] Jesus, Who cometh from above in person, is above all; it is He and He alone whom all mankind is expecting. John, who is of earth, on the contrary hath nothing but what he hath received; but he hath received to be the’ friend of the Bridegroom,’ [St. John iiii 29, 30] His usher; so that the Bridegroom cometh not to the bride but by him. [Ibid. i 7]. But if the Precursor maintains his part in each progressive movement of faith which brings souls nearer to Christ, he intervenes still more markedly in each Baptism conferred, whereby the bride gains increase. The baptistery is especially consecrated to him. It is true, the baptism which he gave to the crowds pressing day by day on Jordan’s banks had never power such as Christian Baptism possesses; but when he plunged the Man-God beneath the waters, they were endowed with a virtue of fecundity emanating directly from Christ, whereby they would be empowered until the end of time to complete, by the accession of new members, the body of holy Church united to Christ. The faith of our fathers never ignored the great benefits for which both individuals and nations are indebted to St. John. So many neophytes received his name in Baptism, so efficacious was the aid afforded by him in conducting his clients to sanctity, that there is not a day in the calendar on which there may not be honoured the heavenly birthday of one or other so named. Amongst nations, the Lombards formerly claimed St. John as patron, and French Canada does the same today. But whether in East or West, who could count the countries, towns, religious families, abbeys and churches placed under his powerful patronage: from the temple which, under Theodosius, replaced that of the ancient Serapis in Alexandria with its famous mysteries, to the sanctuary raised upon the ruins of the altar of Apollo on the summit of Monte Cassino by St Benedict; from the fifteen churches which Byzantium, the new Rome, consecrated within her walls in honour of the Precursor, to the august basilica of Lateran, well worthy of its epithet the golden basilica, which in the Capital of Christendom remains for ever the mother and mistress of all churches, not only of the city, but of the whole world! Dedicated at first to our Saviour, this latter basilica added at an early date another title, which seems inseparable from this sacred name, that of the friend of the Bridegroom. St. John the Evangelist, also a friend of Jesus, whose death according to one tradition occurred on the twenty-fourth day of June, has likewise had his name added to the other two borne by this basilica; but it is none the less certain that common practice is in keeping with ancient documents, in referring more especially to the Precursor the title of St. John Lateran, whereby the patriarchal basilica of the Roman Pontiffs is now always designated. On this day, therefore, let us too imitate the Church; let us avoid that forgetfulness which bespeaks ingratitude; let us hail, with thanksgiving and heartfelt gladness, the arrival of him who promises our Saviour to us. Already Christmas is announced. On the Lateran Piazza (or Square) the faithful Roman people will keep vigil tonight, awaiting the hour which will allow the eve’s strict fast and abstinence to be broken, when they may give themselves up to innocent enjoyment, the prelude of those rejoicings wherewith, six months hence, they will be greeting the Emmanuel. St. John’s vigil is no longer of precept. Formerly, however, not one day’s fasting only, but an entire Lent was observed at the approach of the Nativity of the Precursor, resembling in its length and severity that of the Advent of our Lord. [See Councils, Capitularies, Penitential Canons.] The more severe had been the holy exactions of the preparation, the more prized and the better appreciated would be the festival. After seeing the penance of St. John’s fast equalled to the austerity of that preceding Christmas, is it not surprising to behold the Church in her liturgy making the two Nativities closely resemble one another, to a degree that would be apt to stagger the limping faith of many nowadays? The Nativity of St. John, like that of our Lord, was celebrated by three Masses: the first, in the dead of night, commemorated his title of Precursor; the second, at daybreak, honoured the baptism he conferred; the third, at the hour of Terce, hailed his sanctity. [Sacrament. Gregor. Amal., pseudo-Alcuin., Ord. rom.] The preparation of the bride, the consecration of the Bridegroom, his own peerless holiness: a threefold triumph, which at once linked the servant to the Master, and deserved the homage of a triple sacrifice to God the Thrice-Holy, manifested to John in the plurality of His Persons, and revealed by him to the Church. In like manner, as there were formerly two Matins on Christmas night, so, in many places, a double Office was celebrated on the feast of St. John. … The first Office began at the decline of day; it was without Alleluia, in order to signify the time of the Law and the Prophets which lasted up to St. John. The second Office, begun in the middle of the night, terminated at dawn; this was sung with Alleluia, to denote the opening of the time of grace and of the kingdom of God. Irritated at the sight of the Lamb that he pointed out as the salvation of the whole world and not of Israel alone, Joy, which is the characteristic of this feast, outstripped the limits of the sacred precincts and shed itself abroad, as far even as the infidel Mussulmans. Whereas at Christmas the severity of the season necessarily confined to the domestic hearth all touching expansion of private piety, the lovely summer nights at St. John’s tide gave free scope to popular display of lively faith among various nationalities. In this way, the people seemed to make up for what circumstances prevented in the way of demonstrations to the Infant God, by the glad honours they could render to the cradle of His Precursor. Scarcely had the last rays of the setting sun died away, than all the world over, from the far East to the farthest West, immense columns of flame arose from every mountain top; and, in an instant, every town and village and smallest hamlet was lighted up. ‘St. John’s fires,’ as they were called, were an authentic testimony, repeating over and over again the truth of the words of the Angel and of prophecy, that universal gladness was to hail the birthday of Elizabeth’s son. Like a ‘burning and shining light,’ to use the expression of our Lord, he had appeared in the midst of endless night, and for a time the Synagogue was willing to rejoice in his light; but, disconcerted by his fidelity which prevented him from giving himself out as the Christ and the true Light; [St. John i 20][Ibid. i 29] the Synagogue had turned back again into night, and had drawn across her own eyes that fatal bandage which causes her to remain, up to this day, in her sad darkness. Filled with gratitude to him who had wished neither to diminish nor to deceive the bride, the Gentile world, on her side, exalted him all the more for his having lowered himself; gathering together and applying to herself those sentiments which ought to have animated the repudiated Synagogue, she was fain to manifest by all means in her power, that without confounding the borrowed light of the Precursor with that of the Sun of justice Himself, she none the less hailed with enthusiasm this light which had been to the entire human race the very dawn of nuptial gladness. It may almost be said of the ‘St. John’s fires,’ that they date, like the festival itself, from the very beginning of Christianity. They made their appearance, at least, from the earliest days of the period of peace, like a sample fruit of popular initiative; but not indeed without sometimes exciting the anxious attention of the fathers and councils, ever on the watch to banish every superstitious notion from manifestations, which otherwise so happily began to replace the pagan festivities proper to the solstices. But the necessity of combating some abuses, which are just as possible in our own days as in those, did not withhold the Church from encouraging a species of demonstration which so well answered to the very character of the feast. ‘St. John’s fires’ made a happy completion to the liturgical solemnity; testifying how one and the same thought possessed the mind both of holy Church and of the terrestrial city; for the organization of these rejoicings originated with the civil corporations, and the expenses were defrayed by the municipalities. Thus the privilege of lighting the bonfire was usually reserved to some dignitary of the civil order. Kings themselves, taking part in the common merry-making, would esteem it an honour to give this signal to popular gladness; Louis XIV, as late as 1648, lighted the bonfire on the ‘place de Greve,’ as his predecessors had done. In other places, as is even now done in Catholic Brittany, the clergy were invited to bless the piles of wood, and to cast thereon the first brand; whilst the crowd, bearing flaming torches, would disperse over the neighbouring country, amidst the ripening crops, or would march along the coast, following the tortuous cliff-paths, shouting for joy, and the adjacent islands would reply by lighting up their festive fires. In some parts the custom prevailed of rolling a burning wheel; this was a self-revolving red-hot disk, rolling along the streets or down from the hill-top, to represent the movement of the sun, which attains the highest point in his orbit, to begin at once his descent; thus was the word of the Precursor brought to mind. Blessed are the populations amongst whom is still preserved something of such customs, whence the simplicity of our forefathers drew a gladness more true and more pure than their descendants seek in festivities wherein the soul has no part! To the Office of Lauds, on this day, a special importance is to be attached, because the Canticle Benedictus, which is sung during Lauds all the year round, is the expression of the sentiments inspired by the Holy Ghost to the father of St. John the Baptist, on the occasion of that birthday which gave joy both to God and man. Being unable to insert the entire Office, we give at least this canticle. The two hymns, which here precede it, were composed by Paul the Deacon, as a sequel to that already given above for Vespers. The antiphons, capitulum and versicle used at Lauds are the same as those of second Vespers. Blessed be the Lord God of Israel: because He hath visited and wrought the redemption of His people.And hath raised up a horn of salvation to us, in the house of David His servant. As He spoke by the mouth of His holy prophets, who are from the beginning. Salvation from our enemies, and from the hand of all that hate us. To perform mercy to our fathers, and to remember His holy testament. The oath which He swore to Abraham, our father; that He would grant to us. That being delivered from the hand of our enemies, we may serve Him without fear. for thou shalt go before the face of the Lord, to prepare His ways. To give unto His people the knowledge of salvation, unto the remission of their sins. Through the bowels of the mercy of our God, in which the Orient from on high hath visited us. to direct our feet in the way of peace. The Mass is composed of various passages from the Old and New Testaments. The Church, as liturgical authors say, wishes hereby to remind us that John forMs the link binding together both Testaments, he himself sharing in each. He is the precious clasp which fastens the double mantle of the Law and of grace across the breast of the eternal Pontiff. The Lesson of the Prophet Isaias. Give ear, ye islands, and hearken, ye people from afar. The Lord hath called me from the womb, from the bowels of my mother He hath been mindful of my name. And He hath made my mouth like a sharp sword; in the shadow of His hand He hath protected me, and hath made me as a chosen arrow; in His quiver He hath hidden me. And He said to me: Thou art My servant Israel, for in thee will I glory. And now saith the Lord that formed me from the womb to be His servant: Behold I have given thee to be the light of the Gentiles, that thou mayest be My salvation even to the farthest part of the earth. Kings shall see, and princes shall rise up, and adore for the Lord’s sake, and for the Holy One of Israel, Who hath chosen thee. In these few lines Isaias implicitly refers to the announcement of Christ’s coming: the application here made by the Church to St. John Baptist once more shows us how closely the Messias is united with His Precursor in the work of the redemption. Rome, once capital of the Gentile world, now mother of Christendom, delights in proclaiming, on this day, to the sons whom the Spouse has given her, the consoling prophecy which was addressed to them before she herself was founded upon the seven hills. Eight hundred years before the birth of John and of the Messias, a voice had been heard on Sion, and, reaching beyond the frontiers of Jacob, had re-echoed along those distant coasts where sin’s darkness held mankind in the thraldom of Hell: ‘Give ear, ye islands; and hearken, ye people from afar!’ It was the voice of him who was to come, and of the Angel deputed to walk before him, the voice of John and of the Messias, proclaiming the one predestination common to them both, which, as servant and as Master, made them to be objects of the same eternal decree. And this voice, after having hailed the privilege which would designate them, though diversely, from the maternal womb, as objects of complacency to the Almighty, went on to utter the Divine oracle which was to be promulgated, in other terms, over their cradles by the ministry of Zachary and of Angels. ‘And He said to me: Thou art My servant Israel, for in thee will I glory,’ in thee who art indeed Israel to Me.’ And he said: It is a small thing that thou shouldst be My servant to raise up the tribes of Jacob, and to convert the dregs of Israel,’ [Isa. xlix] who will not hearken to thee, and of whom thou shalt bring back but a small remnant. ‘Behold I have given thee to be the light of the Gentiles, that thou mayest be my salvation even to the farthest part of the earth’; to make up for the scant welcome my people shall have given thee, ‘kings shall see, and princes shall rise up,’ at thy word, ‘ and adore for the Lord’s sake, because He is faithful, and for the Holy One of Israel, Who hath chosen thee’ [Ibid. 6, 7] as the negotiator of His alliance. HIC PRÆCURSOR DOMINI NATUS EST. Let us unite on this day with the devout sons of St. Francis, guardians of those ineffable memories; more fortunate here than at Bethlehem with its sacred grotto, they have not to dispute with schism the homage which they pay in the name of the legitimate bride to the friend of the Bridegroom upon the very spot of his Nativity. Local tradition sets at some distance from this first sanctuary, as we have said, the memorable place where the circumcision of the Precursor was performed. Besides a town-house, Zachary was owner of another more isolated. Elizabeth had retired thither during the first months of her pregnancy, to meditate in silence upon the gift of God. [St. Luke i 24, 25] There did the meeting between herself and our Lady on her arrival from Nazareth take place; there the sublime exultation of the infants and their mothers; there the Magnificat proclaimed to Heaven that earth henceforth could rival, and even surpass, supernal songs of praise and canticles of love. It was fitting that Zachary’s song, the morning canticle, should be first intoned there, where that of evening had ascended like incense of sweetest fragrance. In the accounts given by ancient pilgrims, it is noticed that there were here two sanctuaries placed one above the other: in the lower one Mary and Elizabeth met; in the upper story of this country-house most of the incidents just set before us by the Church occurred. 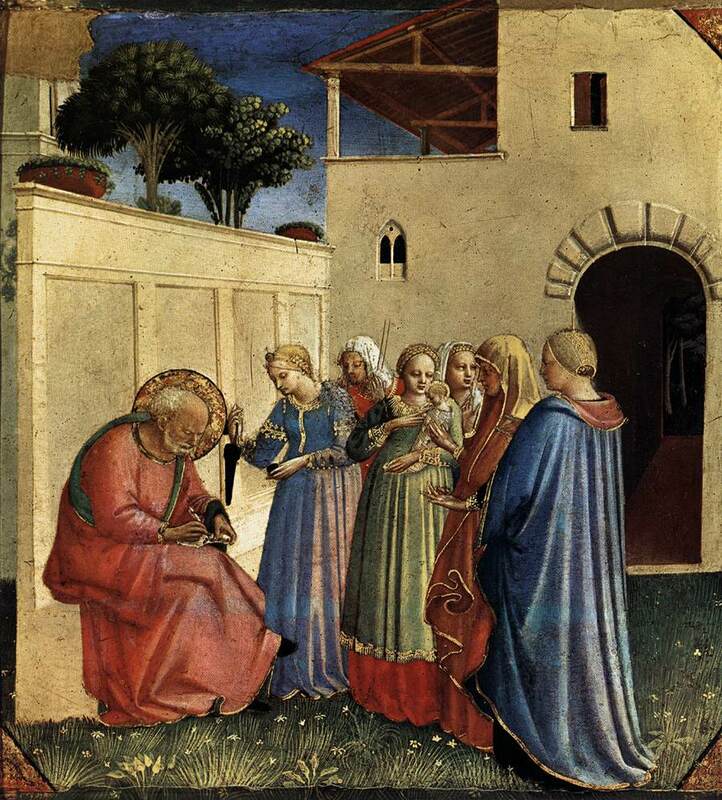 Urban V, in I368, ordered that the Credo should be chanted on the day of St. John Baptist’s Nativity and during the octave, to prevent the Precursor’s appearing to be in any way inferior to the Apostles.